….Built in 1982 by Hokkaido local and jazz musician Syouichi Shimatani (Tohsan), Full Note Pension was operated by Tohsan and his wife Kasan for 35 years, becoming one of the town's most well known and loved pensions (a Japanese-style bed and breakfast)..1982年に北海道の地元のジャズミュージシャンである島谷正一氏（Tohsan）によって建てられたFull Note Pensionは、Tohsan氏とその妻であるKasan氏によって35年間運営され、町で最も有名で愛されたペンションの1つになりました。..由北海道当地和爵士音乐家Syouichi Shimatani（Tohsan）于1982年建造的Full Note Pension由Tohsan和他的妻子Kasan经营了35年，成为该镇最知名和最受欢迎的养老金之一（日式住宿加早餐）。…. ….In 2016, Australian duo Paul Ellis and Ross McSwiney purchased the pension from Tohsan, and renovated the space over the Japanese summer. Sticking with the traditional style of the pension and still maintaining the historical significance of both the pension and Half Note — the adjoining jazz bar — the space has now been modernised into a fully equipped comfortable and stylish bed and breakfast..2016年、オーストラリア人デュオのPaul EllisとRoss McSwineyがTohsanから年金を購入し、日本の夏の間にスペースを改装しました。年金の伝統的なスタイルにこだわりながらも、年金とHalf Note - 隣接するジャズバー - の両方の歴史的意義を維持しながら、スペースは設備の整った快適でスタイリッシュなベッド＆ブレックファーストに現代化されています。..2016年，澳大利亚二重奏组Paul Ellis和Ross McSwiney从Tohsan购买了养老金，并在日本夏季进行了翻新。 酒店保留了养老金的传统风格，同时保留了养老金和Half Note（毗邻的爵士酒吧）的历史意义 - 现在该空间已经现代化，成为一个设施齐全的舒适而时尚的住宿加早餐酒店。…. ….Currently operated by live-in managers Yu Kondo and Tomoko Kamatsu (the new Tohsan & Kahsan), the pension has been updated but continues to operate with the gold class service Japan is known for. 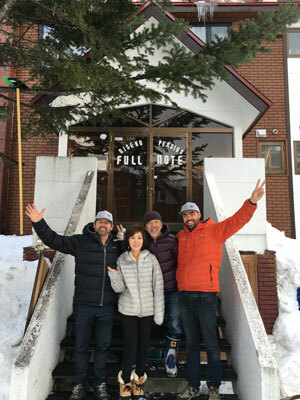 Clean, functional and situated at the heart of Niseko Village, Full Note is now one of Niseko's most popular places to stay all year-round..現在は年金管理人の近藤裕と鎌松知子（新Tohsan＆Kahsan）によって運営されていますが、年金は更新されていますが、日本で知られているゴールドクラスのサービスで運営を続けています。清潔で機能的で、ニセコビレッジの中心部に位置するフルノートは、一年中滞在できる最も人気のある場所の1つです。..目前由住家经理Yu Kondo和Tomoko Kamatsu（新的Tohsan＆Kahsan）经营，养老金已经更新，但继续以日本着名的金级服务运营。 干净，实用，位于二世古村的中心，Full Note现在是二世谷最受欢迎的全年停留的地方之一…. ….Half Note, the original live music bar established by Toshi-san as part of Full Note, has undergone a total revitalisation and now includes a laid-back café style restaurant. Offering an impressive drinks menu, plus an experienced team, Full Note offers an in-house dining experience perfect for after a day on the slopes. The space is also available for events, and offers live music on weekends..Full Noteの一環としてToshiさんによって設立されたオリジナルのライブミュージックバーHalf Noteは、全面的な活性化を経て、現在はゆったりとしたカフェスタイルのレストランが含まれています。フルノートは印象的なドリンクメニューと経験豊富なチームを提供し、ゲレンデで一日を過ごした後に最適な社内での食事を提供します。このスペースではイベントにも参加でき、週末にはライブ音楽を楽しめます。..Half Note是由Toshi-san建立的原始现场音乐酒吧，作为Full Note的一部分，经过全面的复兴，现在包括一个悠闲的咖啡馆风格的餐厅。 Full Note提供令人印象深刻的饮品菜单以及经验丰富的团队，提供内部用餐体验，是您在滑雪场度过一天后的完美选择。 该空间也可用于举办活动，并在周末提供现场音乐表演…. ….Past Owners - Shoichi and Kazuko Shimatani..過去の所有者 - 庄一と島谷和子..过去的所有者 - Shoichi和Kazuko Shimatani…. ….Shoichi Shimatani was born in Shimane prefecture and was raised in Tokyo. Shoichi, once a "salaryman", was relocated to Sapporo by the company he used to work for, and immediately fell in love with the breathtaking nature of Hokkaido. He later on decided to explore a new life in Hokkaido and moved to Niseko in 1982, where he had once visited with his loving wife Kazuko for their honeymoon..島谷正一は島根県で生まれ、東京で育ちました。 昭一はかつては「サラリーマン」でしたが、以前勤務していた会社から札幌に転居し、すぐに北海道の息をのむような自然に恋をしました。 彼は後に北海道での新しい生活を探求することを決心し、1982年にニセコに引っ越しました。そこで彼はかつて彼の愛する妻和子と彼らの新婚旅行のために訪れました。..Shoichi Shimatani出生于岛根县，在东京长大。 Shoichi曾经是一名“工薪族”，他曾经为他工作过的公司搬迁到札幌，并立刻爱上了北海道令人叹为观止的大自然。 他后来决定在北海道探索新的生活，并于1982年搬到二世谷，在那里他曾与他的爱人妻子和子一起去度蜜月。….